I used to work in a record shop and we got new vinyl reissues in around 2006 / 2007. That version doesn't seem to be on here though. Im sure at some point in the 1970s David Gilmour must have heard this release and realized wow what a great technique let me explore that and then.....well The Wall and Gilmours famous echoed stratocaster ala Run Like Hell! A genius of an album by maestro Gottsching. Fantastic reissue. This record rolls! The only record that makes my speakers rattle. Buy with confidence. A selection from the sleeve notes regarding the SQ pressing: "This Cosmic Courier 33 1/3 r.p.m. quadrophonic record is produced by the SQ system which permits the reproduction of sound from four separate channels when a special SQ decoder is used in association with suitable amplifiers and four loud-speakers. This SQ record will be produced as 2-channel stereo when played through standard stereo equipment." 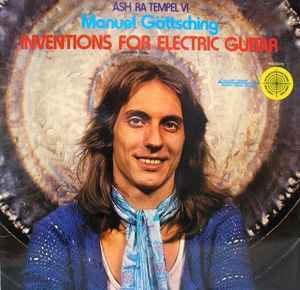 This is essentially a Manuel Gottsching solo album as he really gets help from no one else, but this was also billed as an Ash Ra Tempel album. Perhaps he wasn't sure if he could still legally use the Ash Ra Tempel name or not. This is truly the ultimate solo album, as it's all done by multi-tracked delayed guitar with absolutely no outside help. I have wondered if Steve Hillage got a hold of this album, since he used that very same approach on his 1978 album Green on "Ether Ships". It also happened that Nick Mason from Pink Floyd produced that album, so that same guitar effect was used on The Wall like on "Another Brick in the Will Part 1" and "Run Like Hell". Ozric Tentacles later used the effect occasionally, like on "Dissolution" from Pungent Effugent and on several of their early cassette releases like on Tantric Obstacles. But you go all the way to Inventions for Electric Guitar where that Pink Floyd's The Wall guitar effect had its origins. What you get here is Berlin School electronic music, all done exclusively on guitar, but you might think synthesizers were actually being used but not one synth or any other instrument. "Echo Waves" is that perfect example of that Pink Floyd and Steve Hillage guitar effect, really high paced rhythms, to think this was not done by synths and sequencers is truly amazing. It can be done other ways! That effect was caused by tape delay. "Quasarsphere" is an ambient piece, reminds me of the ambient parts of "Traummaschine" from Ash Ra Tempel's debut, as well as a lot of Klaus Schulze's work. "Pluralis" is more of a mid tempo number. Parts of this sound like a Mellotron was used, but it seemed he was just doing tricks to make his guitar sound like one. Who could have imagined an album using exclusively guitar can end up like this? It's just simply amazing stuff, and obviously an album required in your collection. I think this is the best work of Manuel IMO. True masterpiece. You can listen to this for months without listening to anything else (I just did). Sings the cybernetic soul! Progressive electronic noodlings for all-eternity! Manuel Göttsching is a time traveller, this album is proof of that.